John Roos, U.S. ambassador to Japan, left, shakes hands with Japanese Prime Minister Naoto Kan prior to their talks at Kan’s office in Tokyo on Tuesday, June 22, 2010. On Monday, Kan said he will reassure U.S. President Barack Obama when they meet at a summit this weekend that Japan-U.S. ties continue to be “the cornerstone” of Japan’s diplomacy. John Roos (L), US Ambassador to Japan shakes hands with Japanese Prime Minister Naoto Kan (R) prior to their talks at Kan’s office in Tokyo on June 22, 2010. Kan is expecting to have bilateral meeting with US President Barack Obama at the G8 summit meeting in Canada later this week. 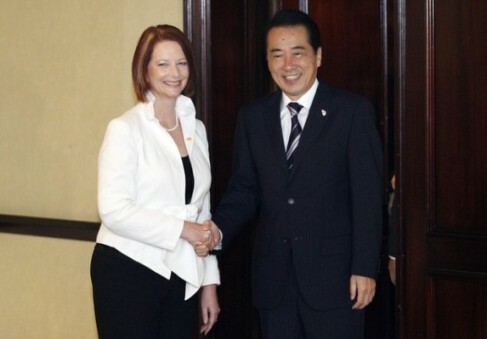 John Roos (L), US Ambassador to Japan, shares smiles with Japanese Prime Minister Naoto Kan (R) during their talks at Kan’s office in Tokyo on June 22, 2010. Kan is expecting to have bilateral meeting with US President Barack Obama at the G8 summit meeting in Canada later this week. (BBC) Japan’s incoming Prime Minister Naoto Kan has vowed to make the country more “vigorous”, tackle national debt and improve relations with the US. Mr Kan was speaking before being sworn in to office by Emperor Akihito. 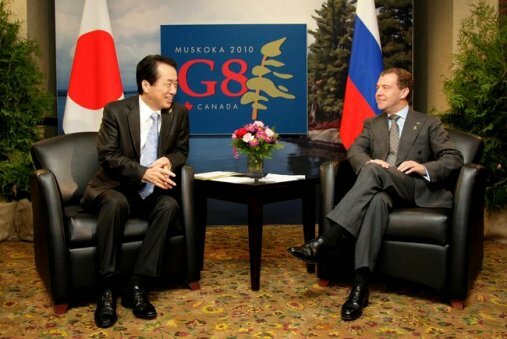 His appointment on Friday followed the abrupt resignation of Yukio Hatoyama. Mr Kan earlier named his new cabinet, keeping 11 of the 17 ministers in place and appointing his former deputy Yoshihiko Noda as finance minister. Mr Hatoyama stepped down last week, amid tensions over a controversial US military base on the island of Okinawa. Mr Kan, the former finance minister, has assured President Barack Obama that he will relocate the base to the north of the island as agreed, despite anger from locals who want it moved off Okinawa entirely. Despite the unpopular move, Mr Kan enjoys poll ratings above 60% as his Democratic Party (DPJ) faces an election for the upper house next month. 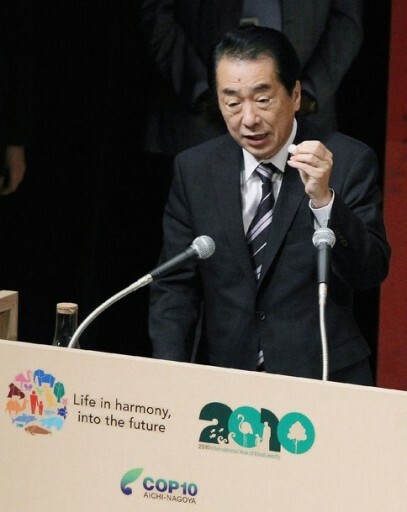 In his televised remarks, Mr Kan said he wanted to “rehabilitate Japan drastically and create a vigorous country”. He said the national debt – the largest debt of the industrialised world, at nearly twice the country’s economic output – should be “handled as the country’s biggest topic”. “Rebuilding financial health is essential for Japan’s economy,” he said. 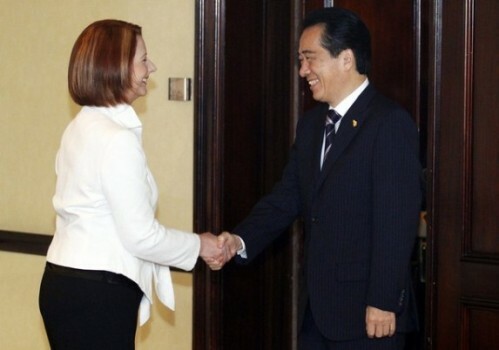 Mr Kan also pledged to restore the relationship with Washington, saying the Japan-US security alliance was the “cornerstone” of Tokyo’s politics. He said he would honour the agreement reached with the US over the future of the the Futenma base on Okinawa, while seeking to “ease the burden for the people of Okinawa”. Earlier on Tuesday, Mr Kan unveiled his new cabinet, which will be sworn in alongside him later. As had been widely expected, he retained many top ministers, including Foreign Minister Katsuya Okada and Defence Minister Toshimi Kitazawa. Mr Noda, his former deputy finance minister and a fiscal conservative, will head the finance ministry. Among the new faces in the cabinet is Renho, a popular television presenter who goes by one name. The 42-year-old, known for her tough questioning of bureaucrats in debates over public spending, has been appointed minister of administrative reform. Announcing the appointments, Yoshito Sengoku, the new chief cabinet secretary, said the ministers were “young, fresh and enthusiastic about their jobs”. “Prime Minister Kan has appointed the ministers mindful of the need to form a government with professionalism, very clean politics and ability to govern,” he said. Later in the day, the ministers will don ceremonial tuxedos and go to the Imperial Palace in central Tokyo to be formally sworn in. Japanese newspapers have welcomed the “son of a salary man” to the post of prime minister, contrasting his ordinary background to the privileged roots of recent prime ministers. On Monday, Mr Kan reshuffled the DJP party leadership. He announced that Yukio Edano would take over as secretary general of the party, replacing the powerful Ichiro Ozawa, who stepped down last week. Shinji Tarutoko, who challenged Mr Kan for the leadership, was named the DPJ’s parliamentary affairs chief. 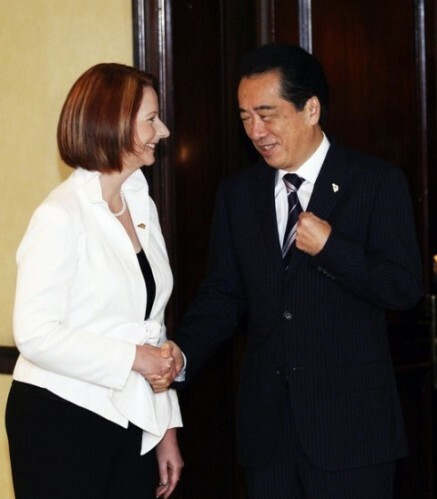 (VOA) Japan is welcoming two-time cabinet minister Naoto Kan as its fifth prime minister in four years. The lower house of Parliament, controlled by the Democratic Party of Japan, elected the newly installed party leader to succeed the unpopular Yukio Hatoyama, whose government was dissolved earlier in the day. Japan quickly scrambled to put a new government into place following the collapse of the Hatoyama cabinet, which lasted less than nine months. Mr. Kan, the incumbent finance minister, moved to the top spot as the Democratic Party of Japan’s candidate. The Lower House of Parliament announced that Mr. Kan received 313 votes compared to his closest challenger, Sadakazu Tanigaki, the president of the opposition Liberal Democrats, who received 116 ballots. The new prime minister, before the parliamentary voting, briefly addressed his fellow party lawmakers after they selected him as the DPJ’s president. Mr. Kan says with the help of all of the DPJ lawmakers he wants to put together firm policies to rebuild Japan ahead of next month’s upper house election. That will be the first big challenge for the 63-year-old new leader. Most analysts are predicting a resounding rebuke from the electorate that would see the Democrats lose control of the less powerful chamber. Mr. Kan will also have to try to repair Japan’s diplomatic standing, especially the relationship with its closest ally, the United States. He will make his debut on the world stage at an important leaders’ summit in Canada in four weeks. Mr. Hatoyama’s ambiguity concerning the future of U.S. military bases on the southern Japanese island of Okinawa is generally blamed for his downfall. During his political ascent, Mr. Kan, a reformer in many areas, has been cryptic about his foreign policy views, including the long-standing defense pact with Washington. He has spoken of a more balanced defense relationship. Analysts predict that as another likely short-time prime minister Mr. Kan may try to avoid getting too involved in the Okinawa base issue, which bedeviled his predecessor. Mr. Kan says, however, he will stick to most of the policy initiatives pursued by his predecessor, including the formation of an East Asian community, along the lines of the European Union. Mr. Kan, a popular figure for taking on bureaucrats during a stint as health minister in the mid-1990’s, is a break from the past. His four short-term predecessors all came from family dynasties rooted in the Liberal Democratic Party, which as the moderate-to-conservative political force, governed Japan for nearly all of post-Second World War era. The new prime minister, characterized as a short-tempered populist, has more humble roots as the son of a factory manager. A physics student in college, Mr. Kan became a civic activist, stressing environmental and feminist causes. 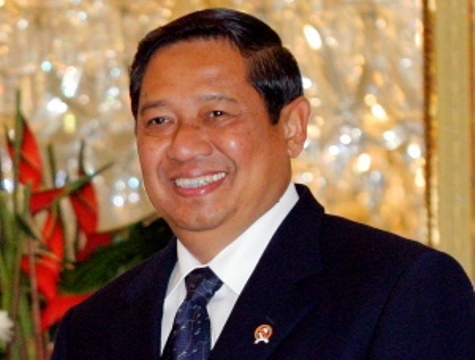 His political career was launched when he won a parliamentary seat as a member of a small opposition party on his fourth attempt. As is the case with many prominent Japanese politicians, Mr. Kan has recovered from scandals, including those about his personal finances and one involving an extra-marital relationship.